Builders design and decorate their spec homes to suit as many people as possible. (The term “builder’s beige” says it all.) It’s a sensible approach but one guaranteed not to please at least some potential buyers. Witness the purchasers of this recently built house in Dunbar-Southlands: They liked the house but wanted to change some of the finishes. The stairway and walls, in walnut, were left unchanged. The stairwell seemed empty, says the homeowner, remarking that “there was nothing that gave it character. 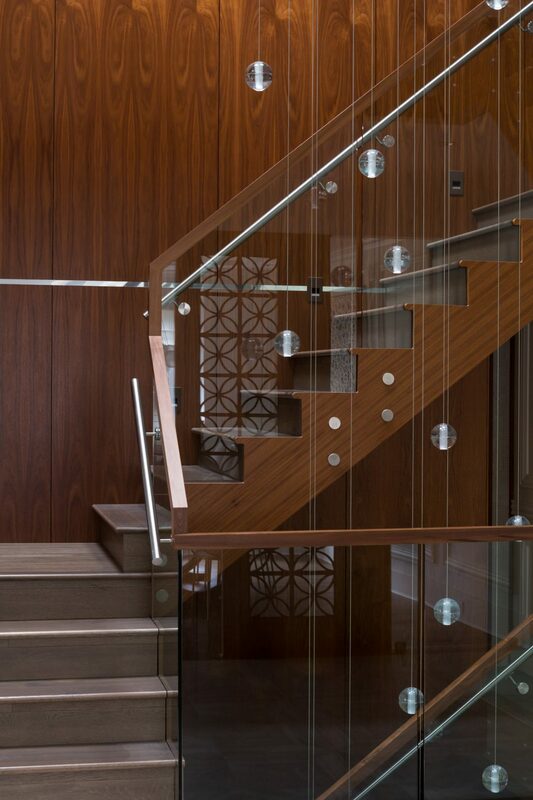 I wanted cool, different lighting for the stairway.” Rodman had globular pendants by Bocci installed. Each hangs at a different height to fill in the stairwell running from the finished basement to the second floor of this 6,500-square-foot home. After the dust had settled, “change some of the finishes” had turned into “redo nearly everything.” Renovation plans went from the homeowners’ desire for some “cosmetic changes” to a substantial facelift. However, they loved the layout of the house and its traditional design elements such as the moldings, so they kept those along with the engineered oak floors. No walls were demolished or rooms added. 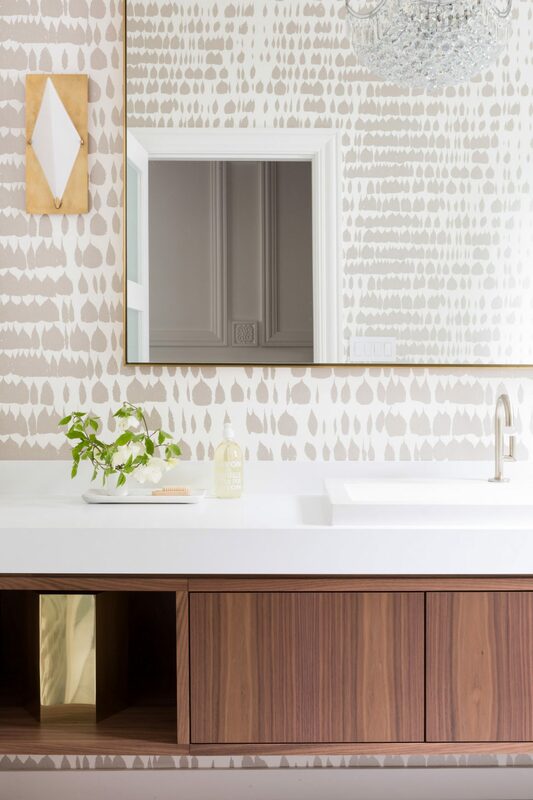 Queen of Spades wallpaper by Schumacher adds the wow factor in the main-floor powder room. Designer Andrea Rodman suggested a mix of traditional and contemporary shapes and fabrics for the formal living room. The ceiling luminaire, coffee tables, and leather-upholstered bench are all by Kelly Wearstler. “Her furniture is like art,” says Rodman. The couple had seen a house designed by Andrea Rodman, interior designer and the principal of Andrea Rodman Interiors. 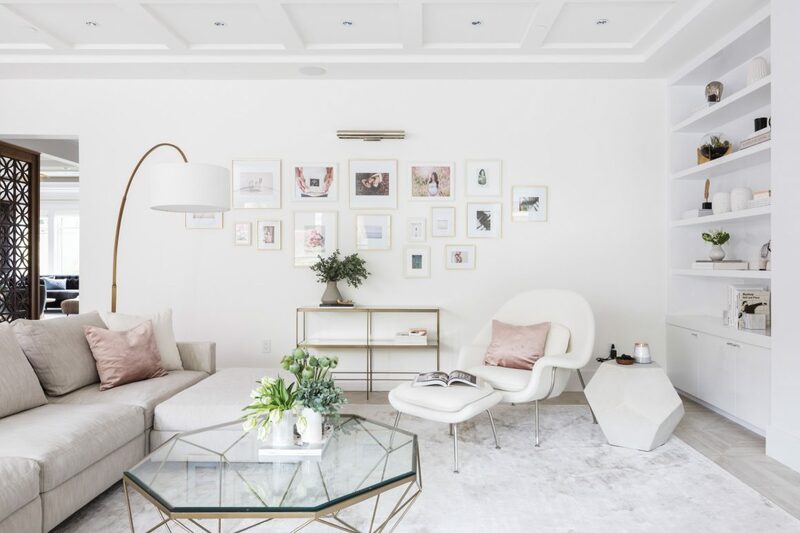 They realized that she would understand their tastes, and they chose her to oversee the transformation from basic builder’s beige to personalized interior. She applied an aesthetic similar to the house they had seen but made it unique for their home. “We told her we wanted something contemporary-modern-traditional-elegant,” says the homeowner with a little giggle. “We’re a young couple. We’re not into full-on traditional. We wanted to keep some of the traditional elements in the house but add in contemporary touches. “We said, ‘minor reno. We want to keep what we can.’ Andrea started suggesting. Then . . . ” The homeowner pauses. “We basically ripped out everything,” she finishes. Before actual work within the house began, Rodman spent almost three months with the homeowners, all consulting closely, to design the new interior. With the expertise of Terris Lightfoot Contracting (“top-notch,” says Rodman), the project then got under way. It was an ambitious undertaking, and nearly a year passed before the homeowners and their two small children moved in. The combined formal dining-living room is immediately visible to anyone entering the house. Its wide entrance is flanked by walnut screens punctured in a lattice pattern, two holdovers from the builder’s decor. “We kept that traditional element; it makes a grand entry,” says the homeowner. In the living room, brown veneer was stripped from the walls. A feature wall around the fireplace was given textured charcoal-coloured wallpaper to contrast with the white-painted walls and ceiling. 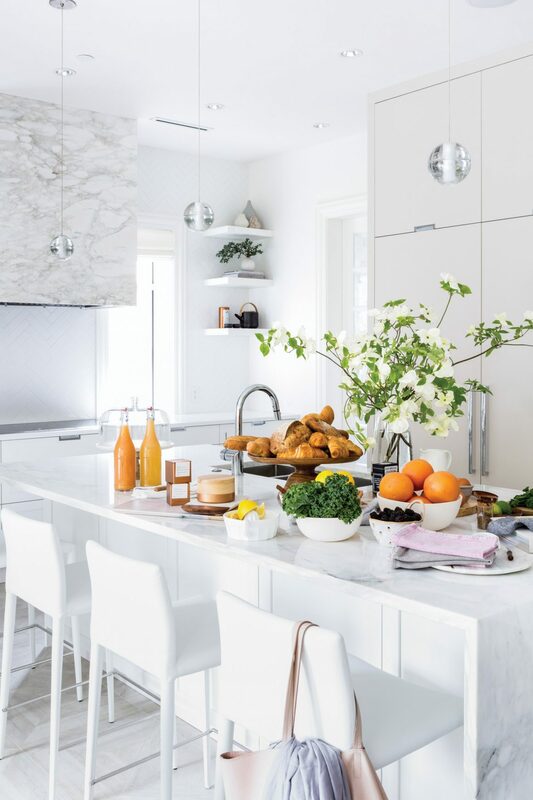 The vent hood over the stove and the large island top and sides are surfaced with Calacatta Piccolo marble. The countertop against the wall houses the cooktop and is highly practical Caesarstone. “The living room had a traditional feeling,” Rodman says. 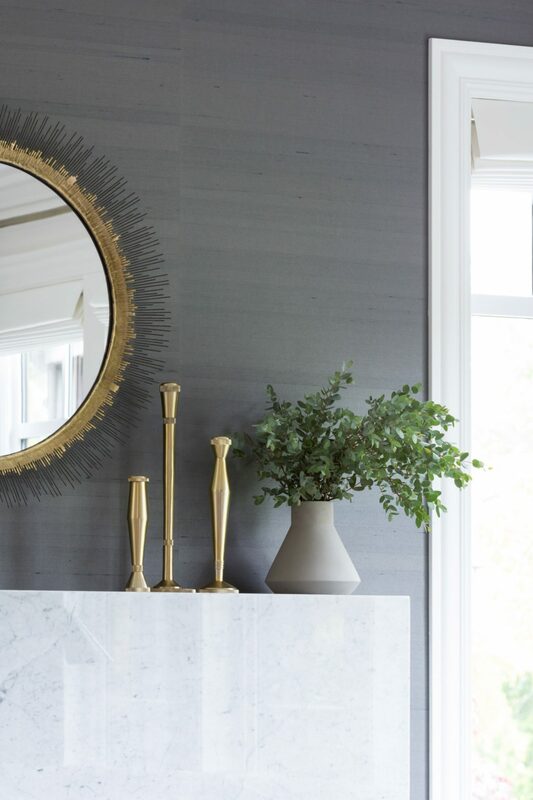 “I thought it would be really fun to mix traditional and modern, to bring in some modern details and high contrast.” The old traditional fireplace surround was replaced with clean-edged, lightly-veined white Bianco Carrara marble. 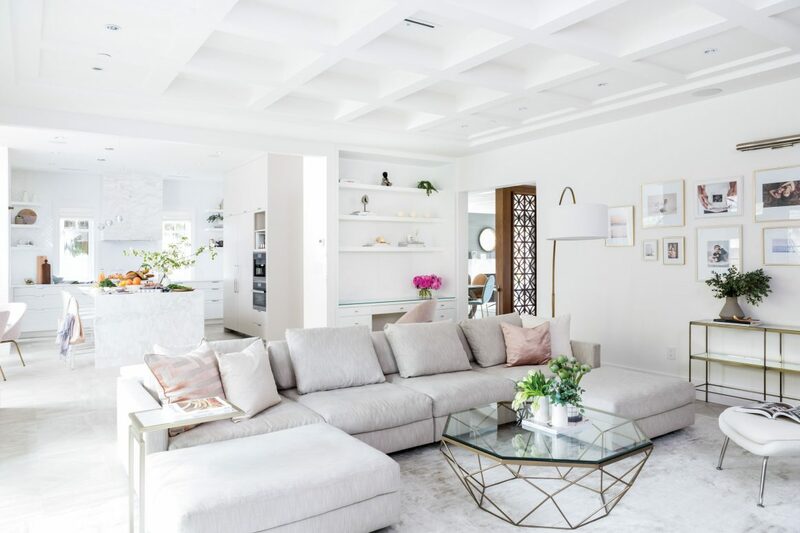 Detailed window casings and the coffered ceiling, which was painted white, were retained; however, the central light fixture is now a trendy three-dimensional starburst luminaire by Kelly Wearstler in gold tones that complement the thoroughly up-to-date coffee tables and bench. At the opposite end of the space is a formal dining area, but contemporary chairs in various pale tones add a lighthearted feeling. 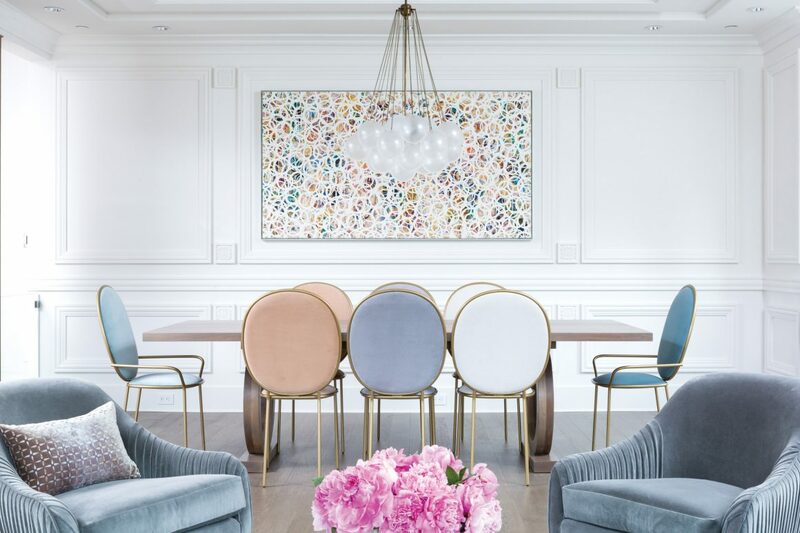 A commissioned painting by Carla Tak echoes the tones in the chairs and the circular decor motif for another contemporary touch. The kitchen is done mostly in white, but the unit containing the fridge and oven is an off-white that picks up a tone from the ceramic floor tiles. The mix of traditional and contemporary styles continues in the main kitchen (there’s also a wok kitchen). Most cabinetry is in time-honoured Shaker style, but recessed pulls, a large island, and a squared-off vent hood are contemporary touches. 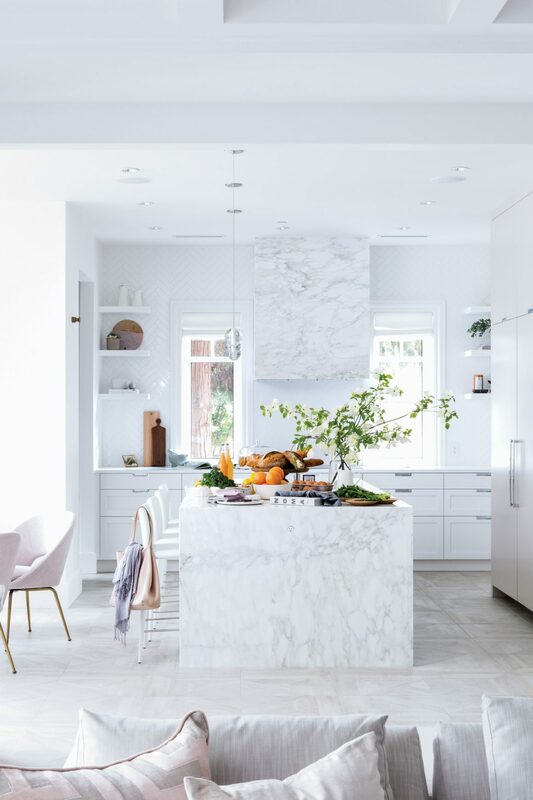 Subtle veining in the Calacatta Piccolo marble island surface and vent hood adds movement, as does the diamond-square pattern of the ceramic floor tiles. 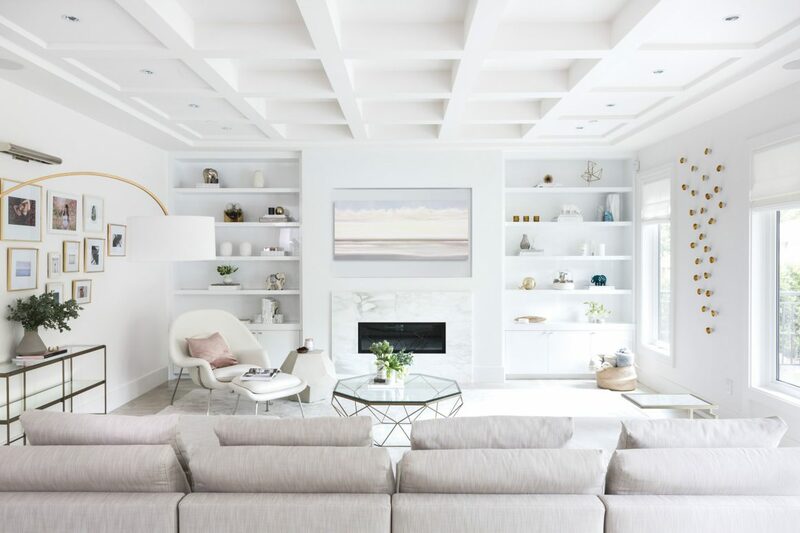 The family room off the kitchen is the site of the only “plastic surgery” done during the home’s facelift: small windows flanking the fireplace were replaced with built-in shelves and storage. Large windows in the outside wall are more than adequate for keeping this pale room bright. As in many households, toy storage for children was an issue. Rodman covered a row of boxes with cushions and placed them directly behind the family-room sofa, thus providing both storage and extra seating for both family room and kitchen. The second-storey decor is also a blend of old and new, traditional and contemporary. There’s plenty of room for the family upstairs. A large stair-top landing doubles as a library-office, and the four bedrooms all have an ensuite bathroom. The family room’s marble fireplace surround is one of the several finishes and design elements repeated throughout the home. Some traditional elements were retained, including the coffered ceiling, which was painted a crisp white. The basement, still in progress, is being outfitted with a wine cellar, an entertainment/rec room, a workout room, a full bathroom with steam shower and a Japanese soaker tub, a theatre room, a guest bedroom with ensuite bathroom, and a laundry room.